The Nazca Grille & Fusion Cuisine at 98 NW State Road in American Fork is a family-owned and operated restaurant highlighting Peruvian food. Eddy Pulido and his family share their favorite recipes and drinks from Pulido’s beloved home country. “Most people think Peruvian food is like Mexican food. It’s totally different flavors – and we don’t use tortillas,” explained Eddy Pulido. “There are over 2,300 varieties of potatoes in Peru! And quinoa comes from Peru.” Most of the entrees on the dinner menu at Nazca are served with rice and some kind of potato, usually fries. Pulido’s mother and sisters still live in Peru and he goes to visit often. “Most of the spices in our dishes are imported from Peru. It’s really the only place we can get them.” Pulido works in the tech industry in Utah, but his heart is in the kitchen. 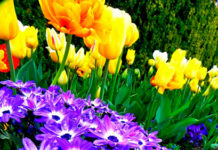 Nazca offers a 15% discount on lunch for employees of companies in American Fork and Lehi. 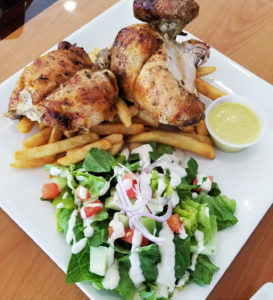 One of the most popular dishes at Nazca is Pollo a la Brasa, a rotisserie chicken served quartered, halved, or whole with fries, a salad and dipping aji sauce (cilantro, onion, and pepper mayonnaise). The chicken is fragrant and impossibly tender, and the best bites were chicken and fries dipped together in the aji sauce. The salad was on the same plate with the entrée–very fresh and with just the right amount of dressing. The kids and adults at our table fought to clean the plate of chicken and fries. Pulido recommended the Lomo Saltado, a dish described as stir-fry vegetables flambé with beef, chicken, or seafood, served with rice and fries. 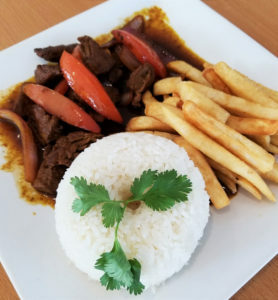 We had the beef, and while the only vegetables in the dish were pepper and onion, everyone in our party agreed that we would order Lomo Saltado again. The rice was perfectly cooked and paired surprisingly well with the fries. The sauce on the dish was everyone’s favorite part of a delicious plate of food. The meat was tender and flavorful. The spice lover at our table thoroughly enjoyed the appetizer Anticuchos, a plate of grilled meat in chile sauce, grilled potatoes, and corn. The spicy-ness didn’t hit until the bite was almost gone, but it was definitely there. Everyone who tried the potatoes in the dish agreed that they were potatoes, but a delicious flavor of potato they’d never tasted. For dessert we had Picarones, Peruvian-style sweet potato donuts served with a sweet fig-based syrup. The donuts were crisp on the outside and had that distinctive sweet potato flavor. The fig syrup had an unusual, but delightful hint of black licorice. Nazca is very clean, and the service was friendly as well as informative. 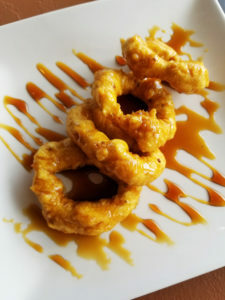 The strip mall location doesn’t provide ambiance to match the quality of the food, but the overall dining experience was transporting and unique. We took you up on your suggestion, and it was spot on! Thank you!! The food was delicious and all I can say is, why wait on restaurants like Olive Garden and Texas Road House when we now have this little gem called Nazca, it’s a grill, but the food is delicious.